The Lamy 2000 Makrolon Fountain Pen remains one of my top tier pens…solidly in my top three…so I suppose that it was inevitable that I’d take a look at the other offerings in the same line. I found this ballpoint on Amazon, for a nice price, and decided to go for it. I mean, Makrolon. and the imperceptible break in the body for changing the refill. The design is just stunning in its simplicity. I knew I’d love the feel of the material, which is smooth, yet very finely textured, and warm to the touch. 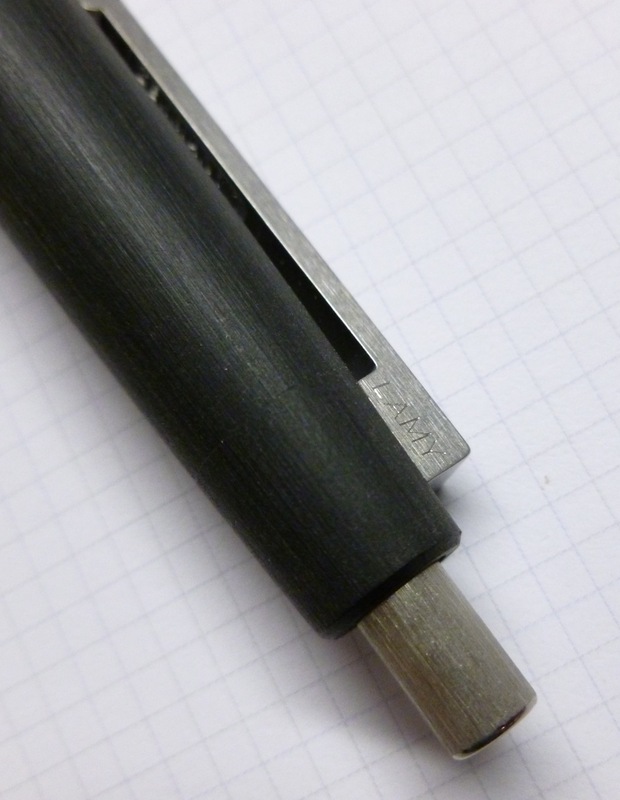 The knock, a ballpoint-specific feature, is rock-solid and offers just the right amount of resistance when pressed to extend or retract the ballpoint tip. The very end of the knock is shiny and reflective, while all of the other metal trim sports a brushed finish. That stuff’s all great (better than great), but what REALLY surprised me was the included M16 ballpoint refill. My complaints about Lamy ballpoint refills are well-documented. I’ve always found them to be washed out looking and very “draggy.” So when I ordered this pen, I was fully prepared to swap in a Monteverde Lamy-style refill. But when I tried the pen as is, WOW…what a difference! This black refill writes dark and smooth and much faster. Not “hybrid ink fast,” but sooooo much better than before. It’s so improved that I decided that the refill swap wasn’t needed. 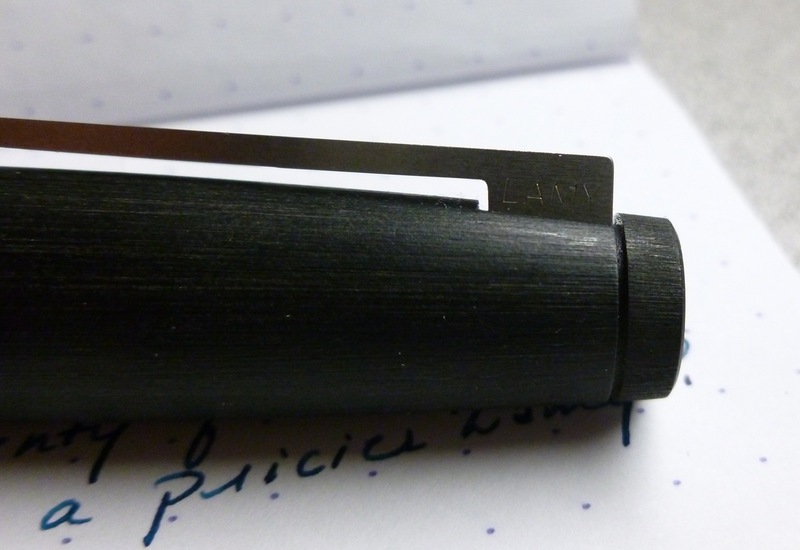 The Lamy M16 refill does the job and does it quite well. Color me shocked. But was this particular refill a fluke, I wondered? (Always the skeptic.) 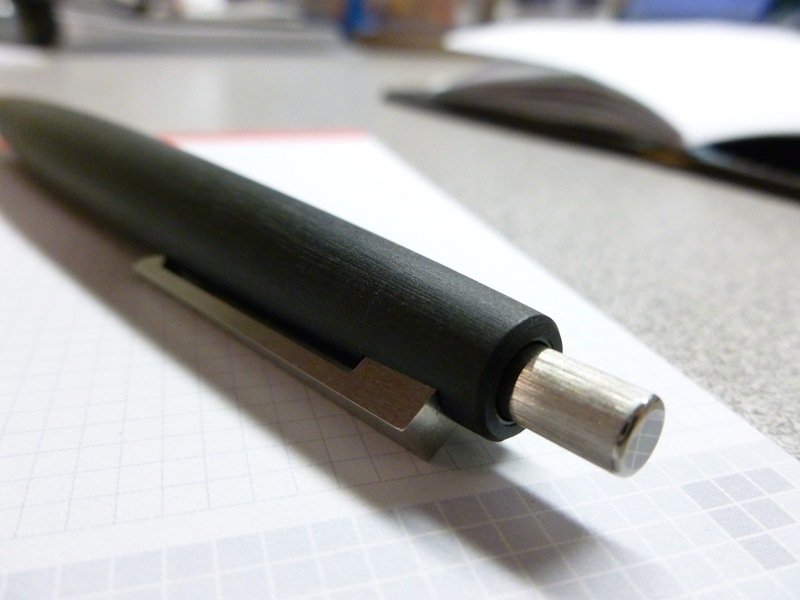 Yesterday another new Lamy ballpoint arrived…the Matte Black AL-Star Limited Edition (thoroughly reviewed here, by Mike Dudek). Would my refill bubble burst? Heck, no. The refill in the AL-Star wrote just as impressively as the one in the 2000. Proof enough for me. 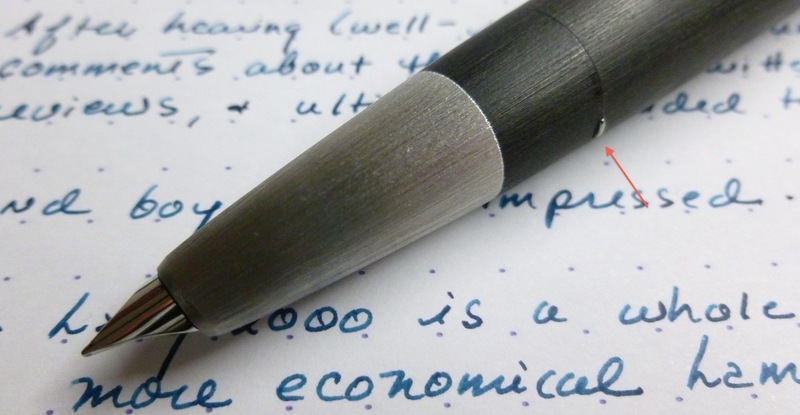 Is the Lamy ballpoint refill perfect? Well, it’s no uni-ball Jetstream or Pentel Vicuna, but it’s leaps and bounds better than it used to be. I’d love to know if the actual ink formula changed or if I’ve just received fresher refills. Whatever the case, the improvement I’m seeing in the M16 refill coupled with the classic styling of the Lamy 2000 body has me reaching for this pen every day. When a pen looks like a million bucks, feels this great in hand, AND lays down a solid dark line, it’s impossible to ignore, even for this fountain and gel pen lover. Now, Lamy, how about a better refill for my Balloon Roller Ball? Please? This pen flew under my radar for quite awhile. Since I have a bunch of Lamy Safaris and a few AL-Stars, I didn’t really see the need for a pricier Lamy. Silly me. 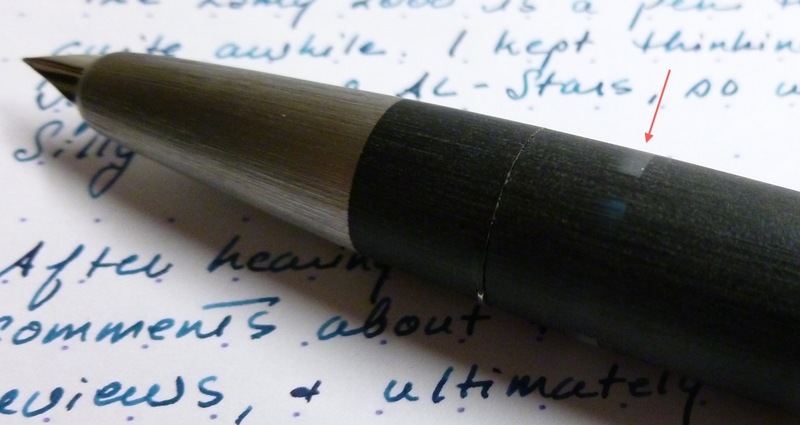 A recent stream of positive chatter on Twitter perked up my pen ears, and I did my usual deep-dive into reviews and even a little digging into the history of the pen. The more I read and watched, the more my interest grew. The more I watched and read, the more I realized that this is a very different Lamy than the ones I already own. 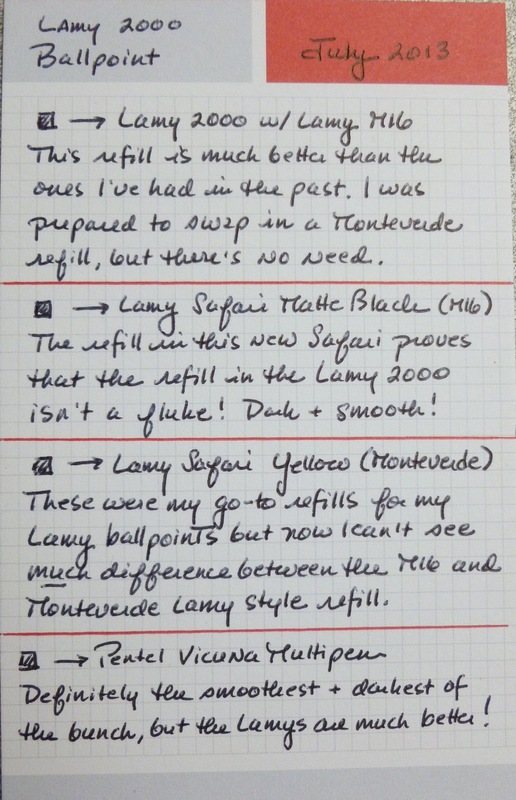 While the Safaris and AL-Stars are perfectly fine, well-made, fun, and colorful, the Lamy 2000 is a true icon. In continuous production since 1966, this is a pen that is gorgeously understated- looking both modern and vintage at the same time. Its subtlety is dazzling, its nib superb. 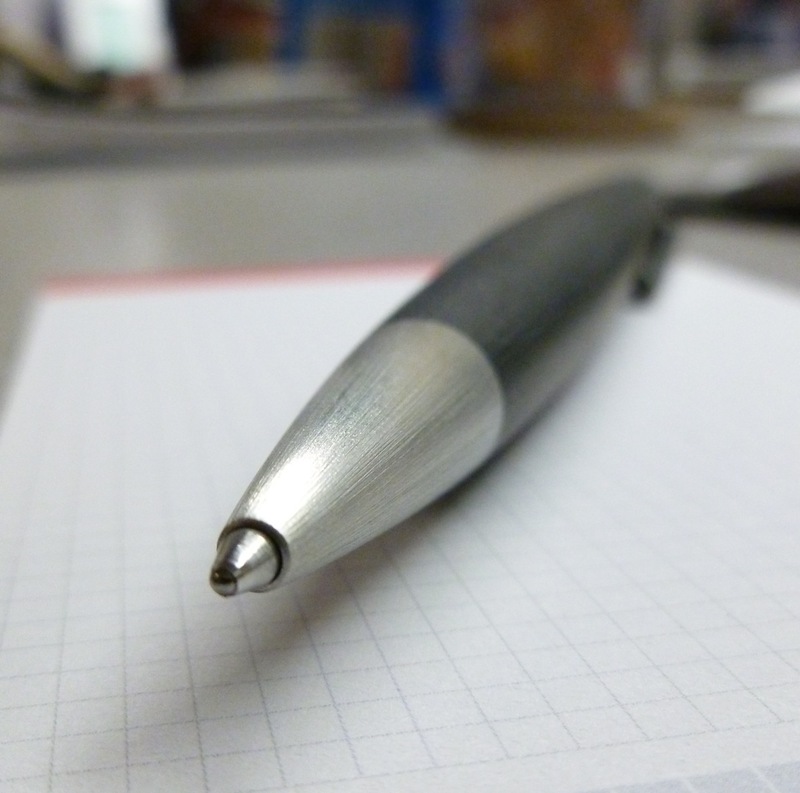 I was immediately blown away by its looks and performance, and could easily see why this pen has been around, virtually unchanged, for 47 years and counting. The pen’s features are SO well-integrated that I opted to use little red arrows to point them out. Like I said, subtle. Because the pen is a piston-filler, bottled ink is required, and luckily I had a drop or two on hand. (Or a liter.) 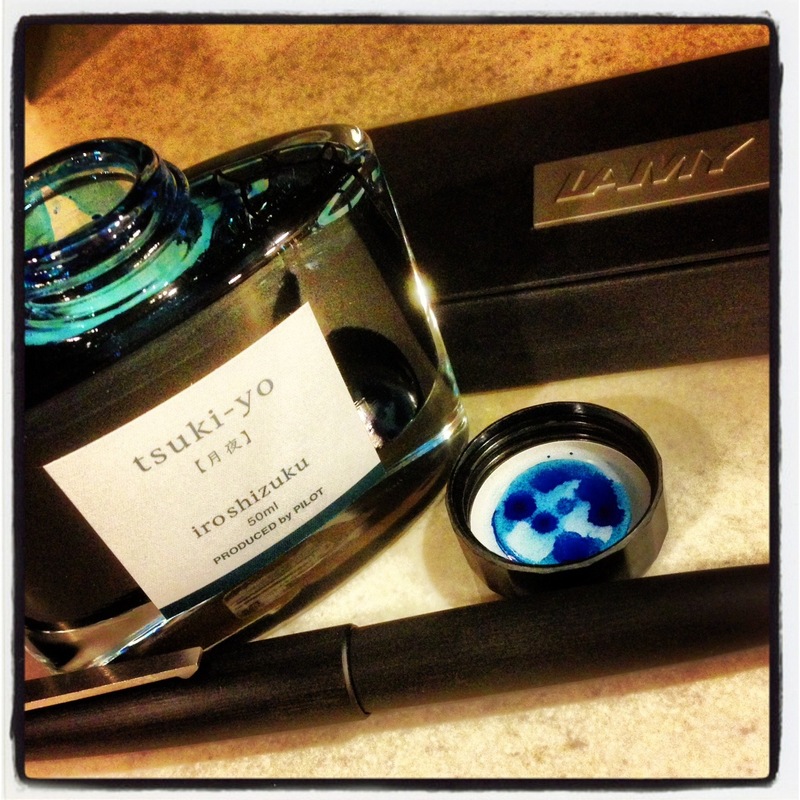 I filled it with Iroshizuku’s tsuki-yo (Moonlight) which is, in my opinion, the perfect ink for this perfect pen. They belong together. Forever and ever. 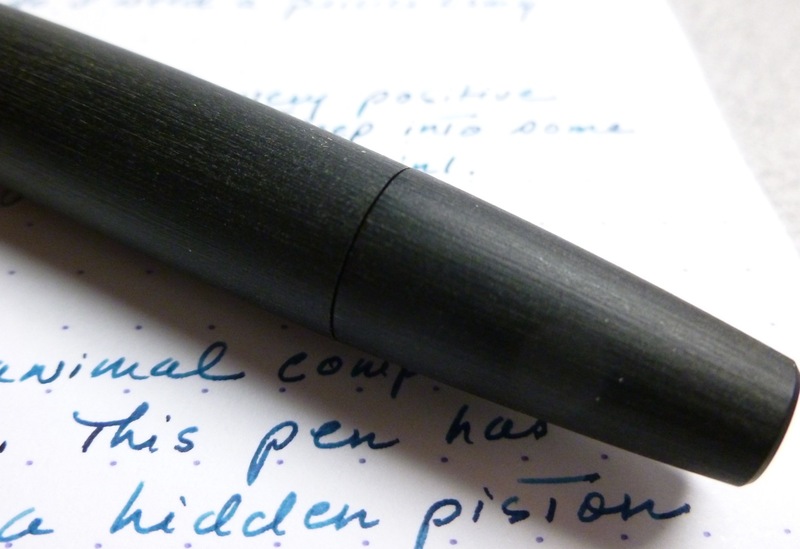 The pen body contains a very faint ink window so that you can keep an eye on the ink level. The red arrow will help you out. The spring-loaded clip is made of brushed stainless steel, as is the section, whereas the rest of the body is made of Makrolon- a high-tech polycarbonate material. I don’t know what that really means, but I have learned that Makrolon is durable and feels great in hand. There’s a matte, VERY finely ridged feeling to the material- smooth with just a hint of texture. I love it. The branding is, you guessed it, subtle. Maybe my favorite part of the pen is its 14kt gold, platinum-coated, hooded nib. I ordered an EF and am thrilled with how it writes. The line is fine, juicy, and exceptionally smooth. Simply perfect. EF and juicy. The slip-on cap is held in place by tiny ears, and feels very secure. The ears bother some “princess and the pea” type folks, but they in no way interfere with my grip, so are a non-issue for me. I enjoy my Lamy Safaris and AL-Stars in all their colors, but I LOVE LOVE LOVE the Lamy 2000. What a design. What longevity. What an icon. 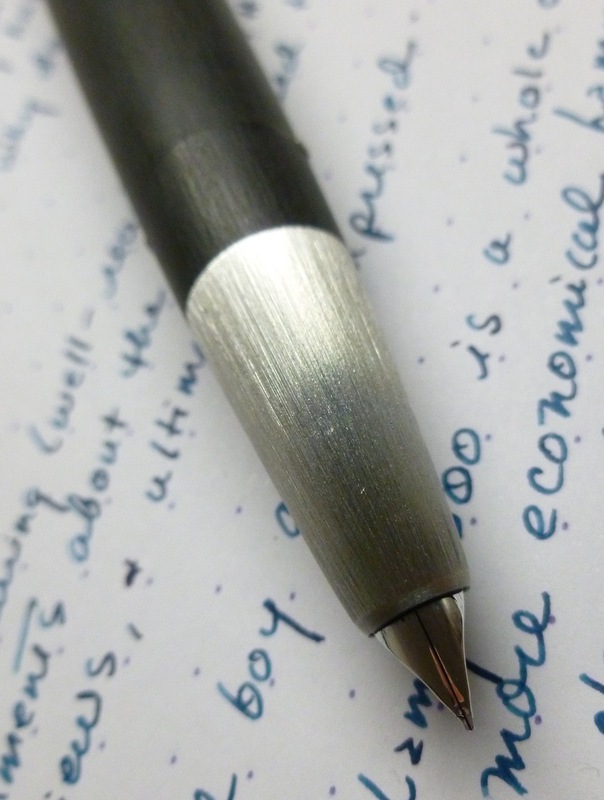 For Stephen Brown’s video review of this pen (the one I studied over and over), click here. 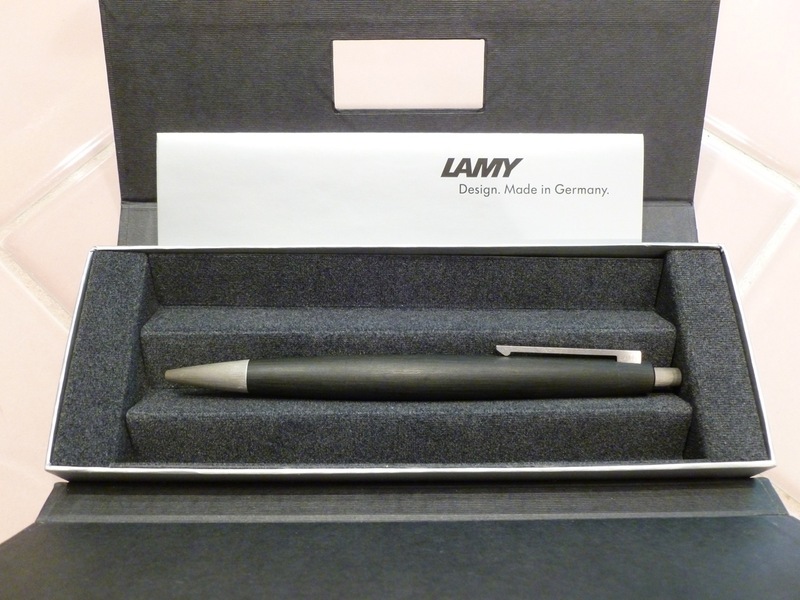 For an amazingly complete 4-part history of the Lamy 2000, click here.